The mind-body connection means that you can learn to use your thoughts to positively influence some of your body’s physical responses, thereby decreasing stress. If you recall a time when you were happy, grateful or calm, your body and mind tend to relax. Research has shown that when you imagine an experience, you often have similar mental and physical responses to those you have when the event actually happens. For example, if you recall an upsetting or frightening experience, you may feel your heart beating faster, you may begin to sweat, and your hands may become cold and clammy. Whether you have been diagnosed with an illness or need to prepare for a medical procedure such as surgery, it is very important to minimize the negative effects and maximize the healthy, healing aspects of your mind-body connection. While the mind-body exercises are not alternatives to medical or surgical treatments, they provide a powerful way for you to actively participate in your own health care, minimize pain and insomnia and promote recovery. The goal of calming and relaxation exercises is to help change the way you perceive a situation and react to it — to help you feel more in control, more confident or secure, and to activate healing processes within the body. Become aware of any tension, anxiety, change in breathing, or symptoms that you recognize as being caused or worsened by stress. When you take about 15 minutes daily to practice the exercises below to help “quiet” your mind and help your body become more relaxed, you can then call upon this ability with a shorter relaxation exercise at a stressful time. Be aware of your current breathing pattern and learn how to change your breathing rate from fast, shallow chest breathing to slow, abdominal breathing. Focus on your breath while you place one hand on your chest, the other over your navel. Imagine there is a balloon in your abdomen. As you take a slow, deep breath, focus on inflating the balloon in your abdomen. You will notice that your abdomen will rise much more than your chest. As you exhale, just let your abdomen fall naturally. 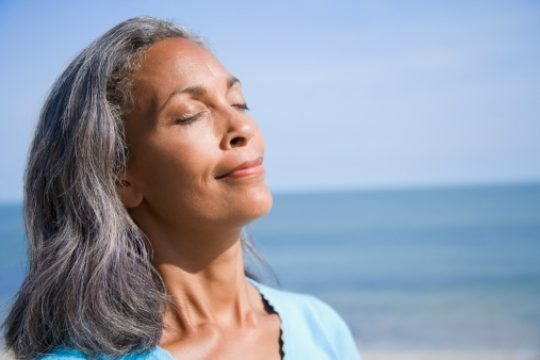 The goal is to learn how to breathe at 6 breaths a minute, about 3 or 4 seconds inhaling and 6 or 7 seconds exhaling. Once you have the slow, deep breathing accomplished, don’t worry about counting and imagine breathing out any tension in the body or thoughts that get in the way of comfort and relaxation. If it helps, you can imagine a spot located on your abdomen, just below your navel. Breathe into and through that spot, filling your abdomen with air, allowing it to expand. Imagine the air filling you inside from your abdomen, and then let it out, like deflating a balloon. With every long, slow breath out, you should feel more relaxed. Begin by interrupting your normal daily thoughts. Think about what is going on around you. Then switch your thoughts to yourself and your breathing. Take a few deep breaths, exhaling slowly. Mentally scan your body. Notice areas that feel tense or cramped, such as your neck or shoulders. Loosen up these areas. Let go of as much tension as you can. Recall and focus on a pleasant memory. Take another deep breath and exhale slowly. You should feel more relaxed. Breathe normally through your nose. Research shows that guided imagery and relaxation can decrease anxiety and pain and possibly shorten your hospital stay. Guided imagery is often presented on an audio program in which you are guided in using your imagination to induce peace, calm, strength and control. The calming music accompanying guided imagery can be helpful in quieting the mind. Massage Therapy is used to support your medical condition and aid recovery from procedures. Massage can help reduce muscle tension, relieve stress and soothe pain. A light, 10-minute massage (with your physician’s approval) can assist your experience of well-being as you are healing. Fee-based massage therapy is offered to family members and visitors to help decrease stress so they can effectively support you. Healing Touch™ and Reiki are relaxing, nurturing energy therapies where gentle touch assists in balancing your physical, mental, emotional and spiritual well-being to promote a deep sense of relaxation. These therapies work with your energy to support your natural ability to heal. A Mind-Body Coach is a trained professional who can teach you multiple ways to use your mind to reach a higher level of peace, calm and comfort before surgery. You’ll also learn the “tools” to help you during recovery, including guided imagery. These techniques will help you release muscle tension and relieve pain. Practice these techniques as often as necessary. Fold and Hold: If a muscle in the shoulders or neck is tight, you can release it without rubbing it. Just bend toward the tight side and hold it for 90 seconds. The muscle should be soft after doing this. this causes any strain on the incision site, stop immediately. Please do not use this method on the legs. Chucking/Jostling: If a muscle is tight, brush lightly over the muscle with your hand and it should release in 30 seconds. Do not rub over any muscles that are near or under an incision, tube or if a medical device is implanted in the area. Centering prayer and meditation are some of the oldest methods of relaxation involving a specific mental focus. These techniques induce a deep state of relaxation and well-being. Many people find spiritual practices helpful in achieving total mind-body relaxation. Music Therapy: Under the supervision of a board-certified music therapist, music therapy combines music and therapeutic techniques and aids in the physiological, psychological and emotional well-being of the individual during treatment of an illness. Art Therapy: Art therapy utilizes art media and the creative process to help patients in their healing and recovery. Art therapy can help patients decrease anxiety, manage stress, and deal with emotional issues.